Every year Local Boards negotiate an annual agreement with the Governing Body (the Councillors and Mayor) that forms part of the Annual Plan and sets out the Board’s budget and service levels. A section of the annual agreement also includes the advocacy projects the Local Board is seeking Council Controlled Organisations like Auckland Transport, Watercare and Waterfront Auckland to deliver. The Waitemata Local Board has a detailed list of advocacy areas to Auckland Transport for delivery as part of the Board’s 13/14 Annual Agreement. Auckland Transport reports quarterly at our monthly business meeting on our advocacy projects (next report due 13 August 2013). 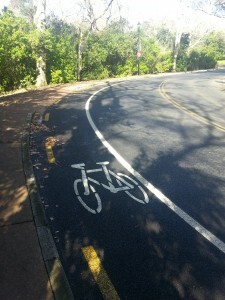 a) Auckland Transport to improve cycle infrastructure through the completion and extension of the Auckland Cycle Network with safe, connected, dedicated cycleways. Wellesley St connection to Auckland Domain under Symonds St overbridge and on-road connection to the NZTA funded / constructed Grafton Gully Cycleway. b) Auckland Transport to prioritise for upgrade, in the 2013/2014 financial year, all routes currently identified as “complete” on the Auckland Cycle Network within the Waitemata Local Board area but are not of a safe standard. a) Auckland Transport and the Board to work together on identifying traffic calming measures for the shopping areas in Parnell, Ponsonby, Karangahape Road and Richmond Road to support 40 km/h zones. This would include for example, raised crossings, raised intersections and kerb build-outs to narrow the road. b) Auckland Transport to extend the trial of a slow speed zone in a residential area. c) Auckland Transport to implement the city centre 30km/h speed zone (as described in the City Centre Masterplan). vi) Great North Road eastbound coming on to Karangahape Road. Intersections with long pedestrian crossing delays. Auckland Transport to advocate for a change of the give way rule requiring motorists to give way to pedestrians at intersections. Auckland Transport to undertake the planned upgrade of Franklin Road to provide for safe and continuous walking and cycling pathways from Ponsonby Road to Victoria Park including continuous pedestrian facilities (i.e. an unbroken footpath on both sides of the road) across all side streets, driveways and intersections (for example by installing raised tables). Develop a traffic management plan for Newmarket to make traffic flow in a way that is logical and supports public transport, walking and cycling and economic development. This would include consideration of parking, arterial infrastructure, motorway access and signage. Auckland Transport to implement the residential parking zone scheme to manage commuter parking in central Auckland suburbs. Contribute to the development of a Masterplan for the Domain (to be led by Auckland Council). Auckland Transport to work with Auckland Council to investigate an upgrade for the western part of Teed St), York Street and Kent Street (the Eastern part of Teed St and Osborne Street having been completed in 2010. Auckland Transport to progress the Auckland Harbour pathway project (the SkyPath) for delivery in 13/14. b) Auckland Transport to create an agreed public consultation framework for the footpath renewal programme. Auckland Transport to fund and deliver the on-road components of the Waitemata Local Board greenways project prioritised for 2013/2014. 14. 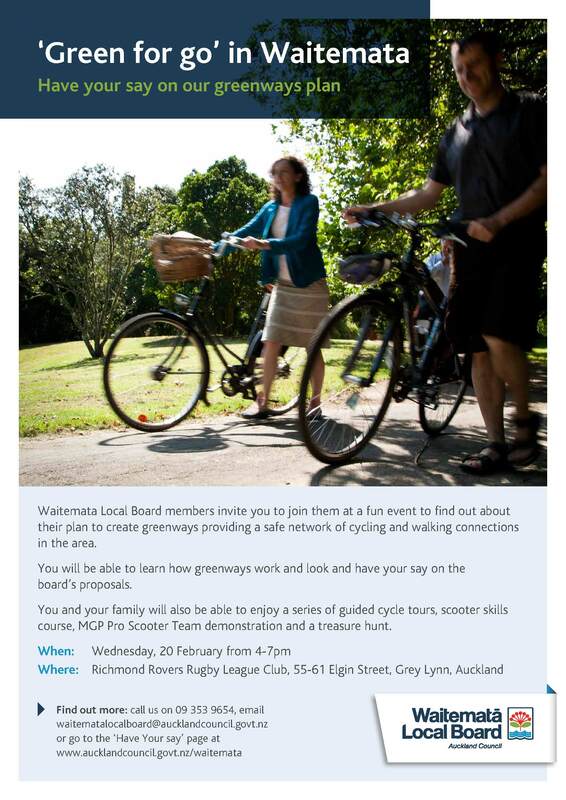 Auckland Transport to set the three year programme of works in collaboration with the Waitemata Local Board with regards to footpaths, road safety initiatives, cycleways, parking, greenways. 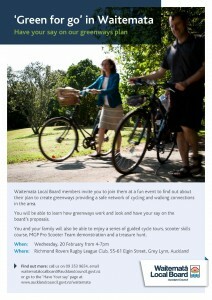 Posted in: Transport, Waitemata Local Board.